Baijiu, China’s most popular spirit, has a reputation for being unpalatable and jarring for those unacquainted with its complex, almost medicinal qualities. 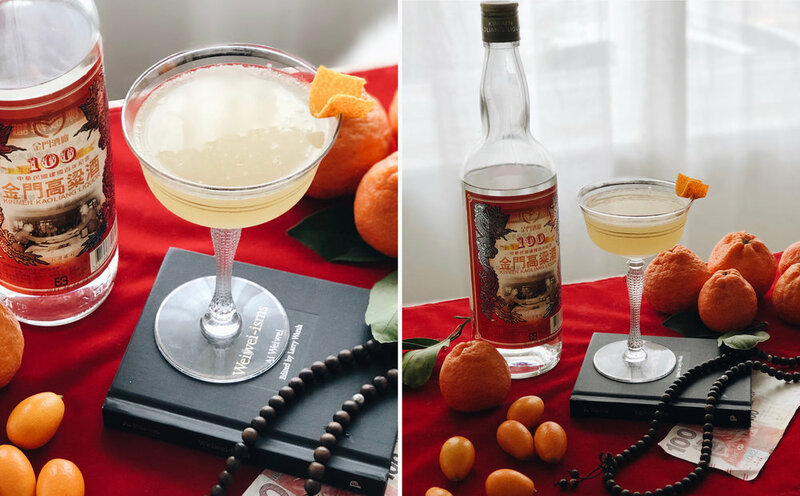 However, this Chinese New Year CBD cocktail uses fortuitous citruses in both the Sous Weed tincture and the Mandarin orange syrup to brighten the more pungent notes while the addition of muddled kumquat helps tamper out the herbal edge, resulting in a high-proof savory concoction that is sure to bring good luck with each sip. 1. Set your sous vide water bath to 158ºF. 2. Place all ingredients in a zip seal bag, push the air out, and seal. 4. Remove from water bath and let cool to room temperature. 5. Strain out the solids and discard. 1. Combine water, sugar, zest & juice in a medium saucepan. Stir to combine, and bring to a gentle boil. 2. Lower the heat and simmer for an additional 5 minutes, stirring occasionally. 3. Remove from heat and wait until room temperature, then strain. Keep in the refrigerator for 7-10 days. 1. Muddle kumquats in a shaker with mandarin simple syrup. 2. Add baijiu, lime (or lemon) juice, and 1-2 droppers of Sous Weed CBD tincture. 3. Shake with ice to chill and strain into a chilled coupe glass. 4. Garnish with a mandarin twist.